We provide excellent personalised service within the intimacy of your own eco-friendly luxurious villa, in Tanah Lot, allowing you to discover what it really means to be in Bali. De Moksha Resort is surrounded by traditional Balinese villages, rice fields and forest, offering you an authentic appreciation of Balinese culture, away from the crowds of this iconic holiday destination. Each of our eight eco-friendly luxurious villas offers a complementary balance between sophisticated contemporary designs, combined with elements of Indonesian craftsmanship, while our unique lush gardens complete the perfect, tranquil environment for your getaway. 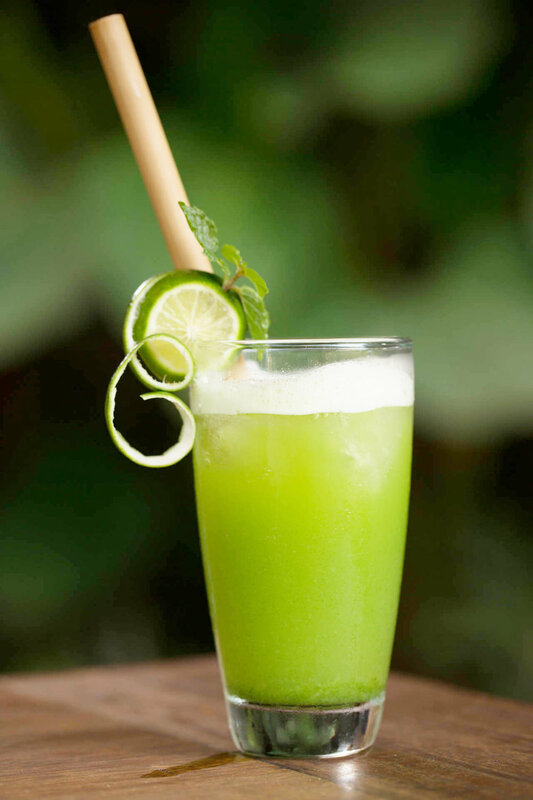 A stay at De Moksha Resort provides memorable moments for your body, mind, soul and palette. De Moksha Restaurant offers a range of inspired dishes while our riverside spa and yoga shala encourage you to relax and unwind with affordable and reasonable rate. Visit the coastal Tanah Lot temple for breathtaking sunsets; tee off to stunning views at Nirwana Golf Course or stroll leisurely along a hidden gem, Kedungu Beach, all within easy reach of De Moksha Resort. Visit neighbouring area Canggu and Seminyak with our De Moksha Resort car where you will find many of Bali's busy touristic dining and shopping spots. From our eco-friendly luxurious villas, amenities and our team, rest assured that your stay at De Moksha Resort has been thoughtfully tailored to provide the perfect environment for your complete relaxation. 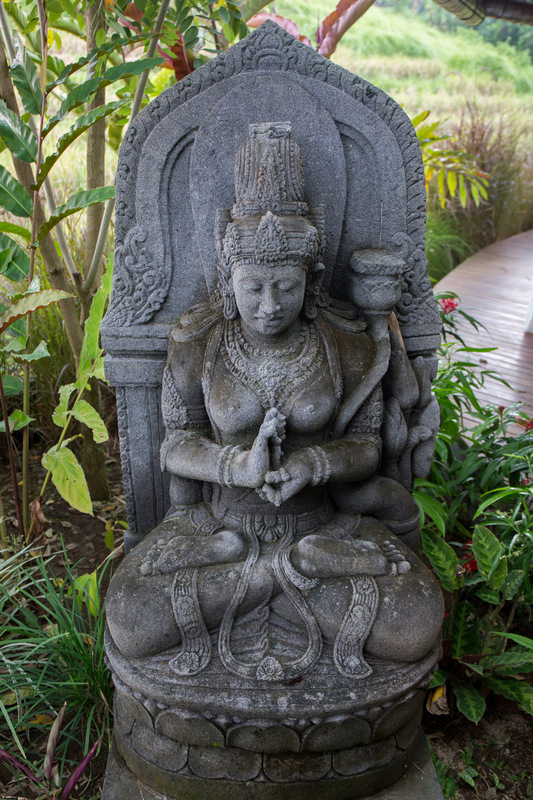 Religion plays a prominent role in Bali, also known as the island of the Gods. You can see this in their daily rituals, and thus our philosophy is based on concepts from the main religion here, which is Hinduism. Moksha, in the Hindu religion and philosophy means liberation, which is the ultimate goal of human life, to be released from Samsara, the cycle of action, reaction and rebirth. This represents how we conduct ourselves and how we present our resort to our guests. 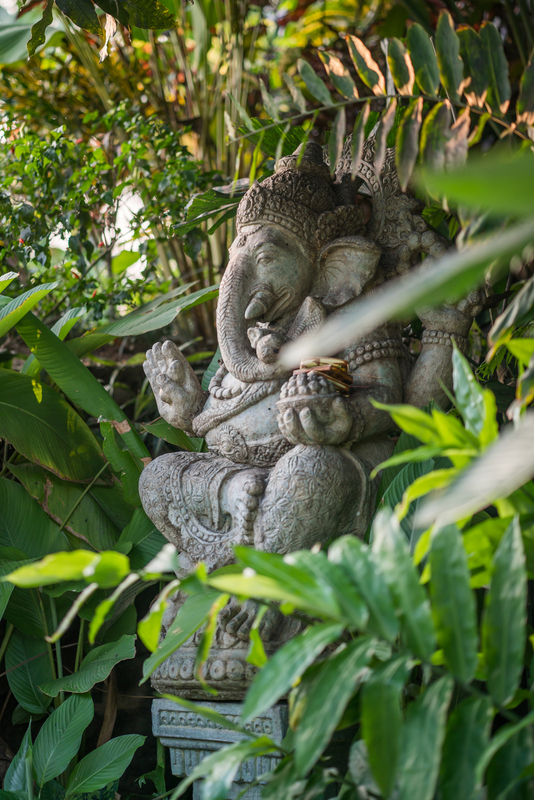 De Moksha Resort's design elements such as the landscape gardens, use of recycled furniture and the unique leaf shape roof, embrace the relationship between creation, preservation and destruction referencing Trimurti; an iconographic representation of God's role. 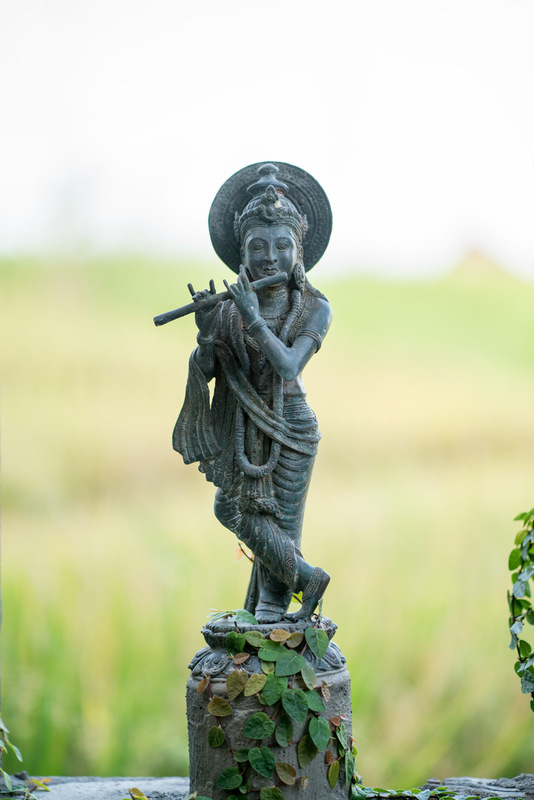 De Moksha aims to be a unique community and cultural center where our guests can interact with like-minded people. Experience the best of Bali's culture, food, flora, rituals and traditions in a single inspiring luxurious destination. We aspire to build trusting and lasting relationships; share memorable experiences with our guests through cultural programs that engage and support local communities and friendships; and to provide meaningful insight into authentic Bali. You can expect to find a variety of dishes ranging from typical Indonesian, Balinese, Italian as well as fusion dishes. Our unique garden restaurant is the perfect spot for romantic dinners or more social events with large groups and get affordable rate. Reconnect to your centre, reconnect to nature. 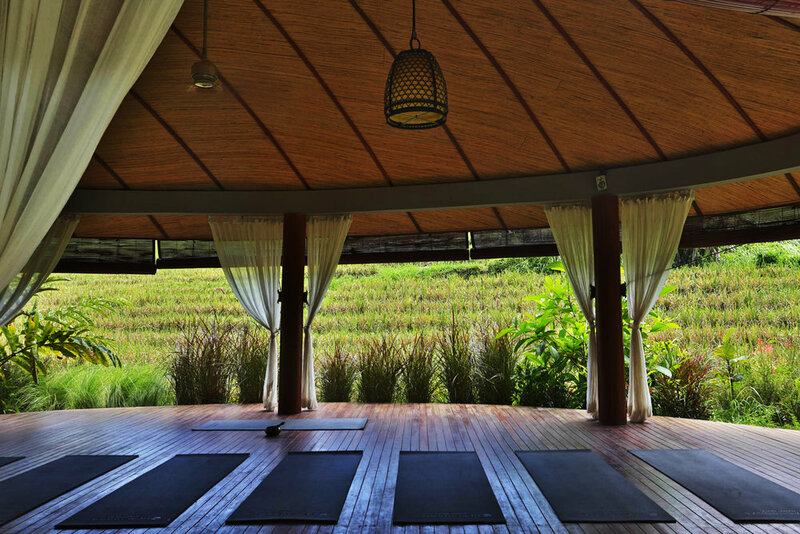 Deepen your practice in our beautiful open-aired, leaf-shaped yoga shala, flanked by rice fields and forests. Our luxurious villa have daily classes, morning and afternoon, as well as private lessons. Find peace and tranquility for your body, mind and spirit, in our riverside spa. Let the sounds of the river and our experienced therapists melt away any stress and tension you may have, and leave feeling completely revitalised. 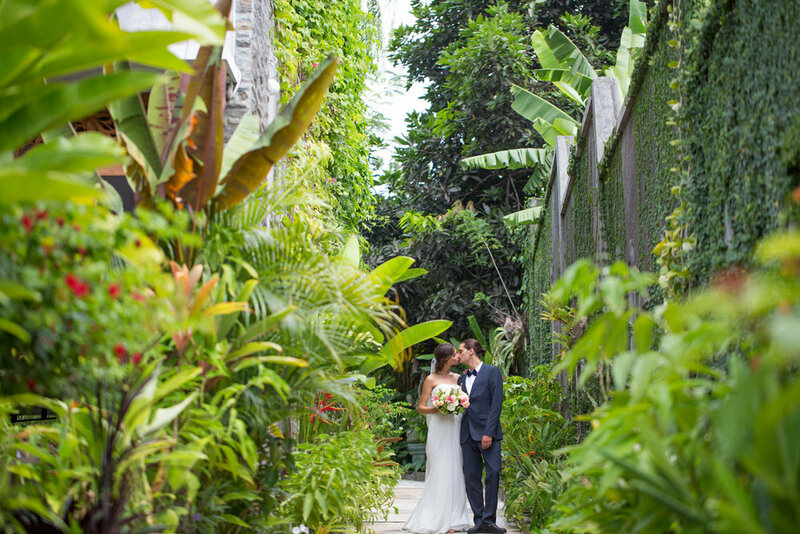 Celebrating love and devotion couldn't be done in a more appropriate place than Bali. Having your wedding here will make for an unforgettable experience that you, your family and friends will cherish for ever more. Bali has it all, whatever it is you're looking for you can find it here. Observe the daily rituals of the Balinese people by visiting one of the many temples to witness a ceremony, or join one at De Moksha Resort. Plan a trip to local markets and get some produce to cook at the resort. Alternatively, go on a shopping trip and end your day by having drinks on the beach to enjoy spectacular sunsets. For the more active holiday seekers, Bali presents you with a variety of activities such as surfing, diving, snorkeling, climbing a volcano, hiking in one of the national parks or rowing a boat over one of the mountain lakes. View our extensive list of activities by clicking the buttons below, or speak to us so that we can plan an unforgettable experience based on your interests, or participate in programs we recommend that highlight the authenticity of Balinese culture. Virtual tour of De Moksha Boutique Resort : You can swipe your finger to change the orientation of direction of the picture.